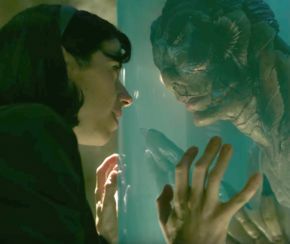 The Shape of Water is movie maestro Guillermo del Toro’s latest cinematic offering, and it is by far one of the best and most magical he’s ever made. Directed, produced and co-written by Del Toro, the film tells a dark and romantic fairy tale that doesn’t shy away from the harsh reality of the real world. Set in the early 1960’s, a mute cleaner working for a government research facility, lives a quiet and lonely life, until an amphibian hybrid creature is brought in from South America. Sally Hawkins, on top form, stars as the cleaner Elisa who falls for the creature. After a childhood accident as a child, Hawkins uses sign language to project Elisa’s thoughts and gives a truly touching and sympathetic performance without a word uttered, something many actors would struggle with. Guillermo del Toro’s go-to creature performer Doug Jones slips on the fins and scales as the amphibian man, bringing the creature to realistic life. As always, the creature’s design is astonishing, with its moving fins and spines, it’s only enhanced by top notch effects to give it a lot of personality that couldn’t be attained with just a practical suit. In a genius move, the creature doesn’t talk, allowing both Elisa and the creature to bond and connect over small things like hard-boiled eggs and Benny Goodman music. The relationship is allowed time to grow and develop a natural romance, with both outsiders finding comfort in each other’s company. Elisa’s two best friends, and the film's two shining lights, African-American co-worker Zelda, played by the brilliant Octavia Spencer, and gay neighbour Giles, played incredibly by Richard Jenkins, are given a good amount of screen time and character development, allowing them to feel like real and kind people who have to deal with the bigotry of the time. Michael Shannon appears as the villain, Colonel Richard Strickland, someone built from his time during in the Cold War and the real monster of the movie, who tortures the creature and insists it must be taken apart to discover its secrets. Like most movies with a government experiment, there’s one person who wants to help, in the form of scientist Dr. Robert Hoffstetler, played perfectly by Michael Stuhlbarg, after witnessing the cruelty inflicted on the creature. With a screenplay by del Toro and Vanessa Taylor, the story sticks closely to traditional fairy tales, and while that may make it slightly predictable, it’s told in a beautiful way that hinges completely on the characters decisions and choices. It may share some similarities to Creature from the Black Lagoon, but this is a very different movie with different themes. It’s a great example of what a modern monster movie can be, without it becoming a fully-fledged horror. Just like the rest of del Toro’s movies, his dedication really shines through. From the gorgeous cinematography by Dan Laustsen to the lavish score by Alexandre Desplat, the film looks incredible and visuals are immersive, such as the old cinema underneath Elisa’s apartment. Overall, this the best film del Toro has made since the enchanting Pan’s Labyrinth. With a beautiful story and well realised characters, this is a modern fairy tale destined to become a classic. Purple Revolver rating: 5/5 – A modern romantic masterpiece.